Fundraiser by Mel Serea : Keep the Russell family together! Keep the Russell family together! 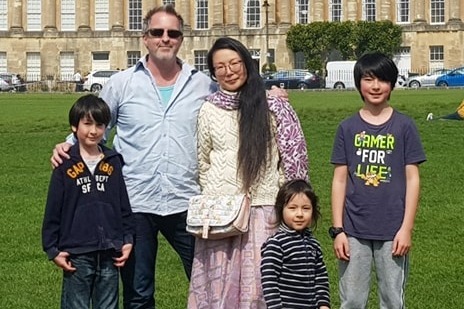 I have created this GoFundMe to help my friends Molly and Andy, and their children Dylan, Devon, and Charlie stay together as a family in Britain - a country which lists the latter four amongst her citizens. To cut a long story short (the long version, should you feel inclined, is below) Molly is from China, where she and Andy met. They fell in love, married, and have 3 children. They have lived in the UK for five years, with Molly on a 30 month spousal visa which was then extended for an additional 30 months, after which they could apply for her to have Indefinite Leave to Remain which they duly did. They meet the Minimum Income Requirement of £18,600 needed to Indefinite Leave. In fact, they would exceed it by about £6000 had the Home Office not decided to exclude just enough of Andy's earnings to put them at £18,494 and therefore make their application suitable for rejection. The family - and their friends - are devastated; the children are terrified they will either yet again be separated from their mother, or else ripped away from all their friends if the family are forced to move back to China. And all at the hands of their own government. Please give what you can - and even if you aren't in a position to help financially please spread the word! "Recognizing that the child, for the full and harmonious development of his or her personality, should grow up in a family environment, in an atmosphere of happiness, love and understanding"
Despite the fact that Britain, along with 193 other countries worldwide, has ratified the UN Convention on the Rights of the Child, and has thus recognises that children have the right to 'grow up in a family environment', UKVI has rejected the Russell family's application for Molly's Indefinite Leave to Remain in the UK - and therefore denied 3 British children their right to have their mum live in their country with them. Molly and Andy Russell met and fell in love when Andy was working in China. They were married, and before long boys Dylan and Devon arrived. The family decided to move back to Britain, where Andy's parents lived and so applied for a spousal visa for Molly. This necessitated a long, painful year in which Dylan and Devon - who, at 3 and 5, were too young to fully understand why Mummy was only ever visible through a computer - were separated from Molly by 1000's of miles whilst Andy worked flat out to ensure he met the strict income demands of a spouse visa application. The entry visa was granted and lasted lasted for 30 months. Their application to extend this by a further 30 months was also accepted. By then, they had a 3rd child, Charlie, and at the end of this 5-year period Molly was entitled to apply for Indefinite Leave to Remain. At this point, both Dylan and Devon have spent up to 5 years at school making friends and the whole family have built a life in Bath, with Andy having become the director of his own company and the older boys happily settled in school. It was a no-brainer, then, to apply for the Indefinite Leave to Remain because choosing to go back to China would mean not only ripping the boys away from the only lives they had known since the ages of 3 and 5, but also leaving behind the jobs and relationships Andy and Molly had worked so hard to build. So, of course, they applied. They were nervous, obviously, but knew that Andy's earnings from his company, plus his earnings from working for national education companies, put them well over the Minimum Income Requirement. Or, rather, they would have, had UKVI not decided to exclude just enough of Andy's earnings (earnings upon which tax and national insurance was paid and which the employer, one of the most reputable schools in the UK, also verified) to put them just £100 shy of the MIR. Which brings us to the point we are at now: the family were given 10 days to pay £500 to prevent Molly being instantly deported. Luckily, a family friend was able to lend them the money - because as we all know, finding a spare £500 with only 10 days notice when you have 3 young children is no easy task. This allows Molly to stay for another 30 months, which will enable the family to re-apply for Indefinite Leave to Remain. However, this application will (like the previous one) cost £2389 (possibly even more, as the government frequently increase it). Please, please help to raise the money needed to keep this family together, in the country in with 4/5 of them are citizens. I have set up this GoFundMe because it both breaks my heart and makes me apoplectic and ashamed that our government could treat a family - its own citizens - in this way. I truly believe that the main motivation in denying Molly's application is the hope that the whole family will, if it is the only way they can stay together, end up moving back to China, thus making net immigration lower by 5 people - and if this is happening to one family, it is probably happening to countless more. I want to show UKVI and the government that they cannot win through sneaky, underhand methods because we will come together as a community and make sure they don't! I've taken the decision to increase the goal amount. The reason for this is that the Home Office are demanding £1000 for the NHS surcharge (£500 of which has already been generously donated by the owners of South Torfrey Farm) so the additional £500 is being added to the current goal target which represents the current application fee - itself likely to significantly rise before the Russell's have to reapply in 30 months' time. A further £1000 is being added to go towards legal fees.